Each map is available for free; in addition, many maps are available in collections that cost $9.00. The collections include the same maps as the free downloads, but they include related maps grouped together—maps of all the continents or all 50 of the United States—and can be downloaded all at once instead of individually, saving time for you. The free version (below) is a map of the United States. It's PDF file, which you can view and print with Adobe Acrobat. 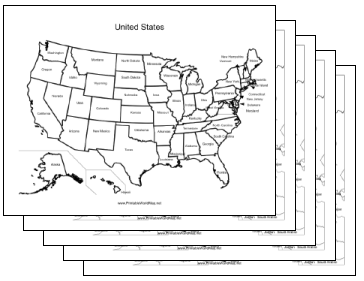 The $9.00 United States labeled Map Collection (shown below) includes that same map, plus individual maps of each of the 50 states and the District of Columbia. You can pay using your PayPal account or credit card. You'll be able to download the map collection within moments. Maps require Adobe Acrobat Reader or another program that can display the PDF file format.